Oman with its capital Muscat is located in Asia (Middle East, bordering the Arabian Sea). It covers some 309,501 square kilometers (twice the size of Georgia) with 3,424,390 citizens. 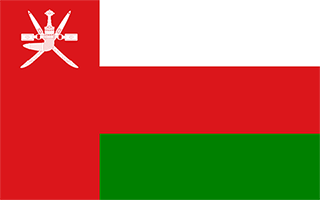 Arabic, English and Urdu are the common languages used in Oman (consider regional differences). Saudi Arabia, United Arab Emirates and Yemen are bordering countries. Oman is in the Middle East, on the eastern end of the Arabian Peninsula. Until Sultan Qaboos bin Said exiled the previous Sultan in 1970, Oman was an under-developed nation, and almost completely closed to visitors. Since that time, education, public works and tourism have taken off throughout the country. To reach someone Oman dial +968 prior to a number. The local cellular networks are operated on 900 MHz, 3G, 4G. Websites typically end with the top level domain ".om". If you want to bring electric appliances (e.g. battery chaarger), keep in min the local 240 V - 50 Hz (plugs: G). The sign for the locally used currency Rial is OMR. Three horizontal bands of white, red, and green of equal width with a broad, vertical, red band on the hoist side; the national emblem (a khanjar dagger in its sheath superimposed on two crossed swords in scabbards) in white is centered near the top of the vertical band; white represents peace and prosperity, red recalls battles against foreign invaders, and green symbolizes the Jebel al Akhdar (Green Mountains) and fertility.